In this post I will outline the new Facebook News Feed changes, what they mean for your future marketing, and what you can do now about these changes. “As we roll this out,” Zuckerberg wrote, “You’ll see less public content like posts from businesses, brands, and media. And the public content you see more will be held to the same standard—it should encourage meaningful interactions between people. In terms of advertising, this means that the space in News Feed will be limited (less ads displayed at a more expensive price / higher bid). As the changes roll out over the next few months, businesses will most likely see a significant decrease in organic reach. When is this going to start rolling out? Quoting Zuckerberg, “it will take months for this new focus to make its way through all our products. The first changes you’ll see will be in News Feed.” But some people and pages have already started to see a different type of experience. It might happen sooner than we thought. Facebook will “prioritise posts that spark conversations and meaningful interactions between people,” said Adam Mosseri, Facebook’s VP of News Feed. Continue posting engaging, quality content that prompt comments naturally. Encourage customers to follow your Facebook page: One thing that’s not changing about the Facebook news feed is the ability for users to make sure they always see posts from their favourite Pages by choosing “See First” in their news feed preferences. If you’re not already running ads on Facebook, this is worth considering to fill the potential loss of organic exposure. If you already run advertising campaigns, consider expanding these further. Invest time in Facebook Groups: businesses should look into new ways to engage customers with Groups, alongside their Pages and advertising efforts. Learn Messenger Chatbots: Moving conversations into Messenger and using bots will be a huge trend that will allow you to nurture leads and sell. 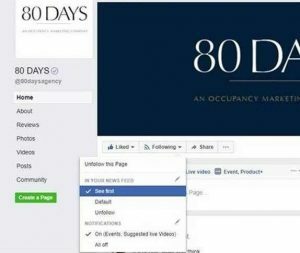 80 DAYS can provide support and guidance throughout this process and a range of social media marketing services for hotels and travel brands. For example, social media training sessions, social media audits, strategies etc. Do let us know if we can support your business.